All organisations want to ensure that training budget is well-spend and new skills are applied in the workplace, but it's sad but true that we forget things very quickly after we "learn" them. 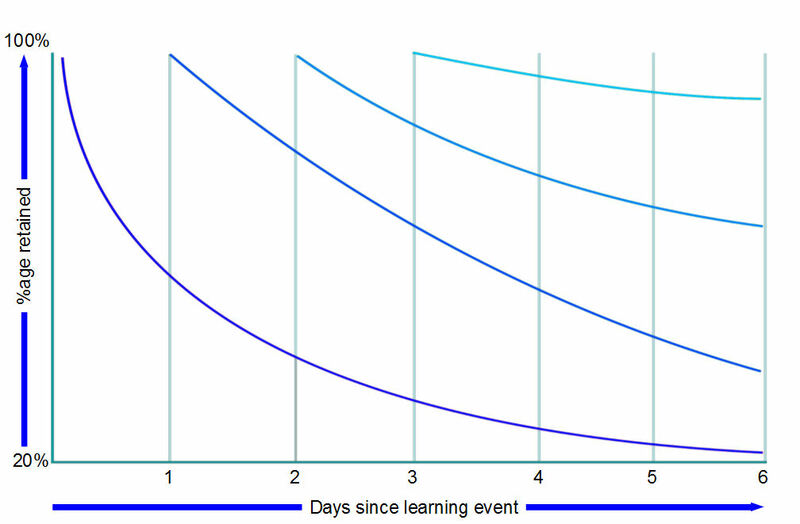 Hermann Ebbinghaus showed back in 1885 that 77% of learning is forgotten within 6 days and modern research in the USA shows that not much has changed in the last 130 years. This natural inability to remember what we're told results in a terrible ROI on any training investment we make. Let's look at the ROI of training investment in a typical training course - on Findcourses.co.uk, a typical leadership course costs £1,400 for 2 days. Now let's say you only use 23% of what you learn - you're paying £1,400 for £322 worth of content. In everyday terms, that's like buying a bottle of wine, drinking one average-sized glass, and pouring the rest down the sink. I guess it depends on the wine, but in general that's not what most people do. Yet apparently that's okay to do with business training programmes. Whereas for some organisations, a few new skills for their workforce is sufficient, for most businesses it's not enough. We're well-versed in bringing lasting change to organsations using our "Four-A" approach to staff development. At Navanter, we've taken Ebbinghaus' findings to heart in developing our learning process, to bring real, lasting change to organisations. You wouldn't take your car to the garage and ask for a new alternator if you didn't know that was the problem. So why spend your budget on training which may not help in the right areas? When we engage with your business on bespoke work, we always begin by understanding what you and other stakeholders want to achieve, and where you are now. This identifies a clear gap into which we can design a solution. The result is that our training, coaching or cusultancy is targeted at the most important weaknesses, and that effort isn't wasted on areas of strength. Following our assessment, we give you our recommendation. This opens a discussion with you about what's really right for your organisation, your goals and your budget. Our aim is to be able to offer you a number of choices, and advise on those options which we feel will best meet your needs. There is nothing prescriptive about our recommendations - together, we consider the benefits of each option to ensure you're comfortable with your choice of solution. This is where we actually deliver your learning. This could be through either off-the-shelf or customised training, coaching, consultancy, or a blend of these. Our high-calibre consultants will guide your team through interactive, effective learning to achieve the change you're looking for, to solve your problem or increase your organisational talent pool. Once your employees have been through a learning event, it's vital to take steps to ensure the learning is adopted into the workplace and that genuine change occurs. We offer industry-leading options to aid adoption of learning, from preparing your managers to provide this internally, through a range of free tips by email to a structured programme of coaching, mentoring and reinforcement. Our goal is the same as your goal: to ensure that new learning is integrated into the daily tasks of your employees. Why not take that first step towards business success today? Get in touch with Navanter to discuss how we can help you with your business challenges. Whether it's sales, leadership, presentation skills, communication skills or team-building, we're here to bring you the results you need.